Federal Investigators Pinpoint What Caused String Of Gas Explosions In Mass. The National Transportation Safety Board says a natural gas company engineer made a major mistake in developing construction plans, resulting in a disastrous chain reaction. 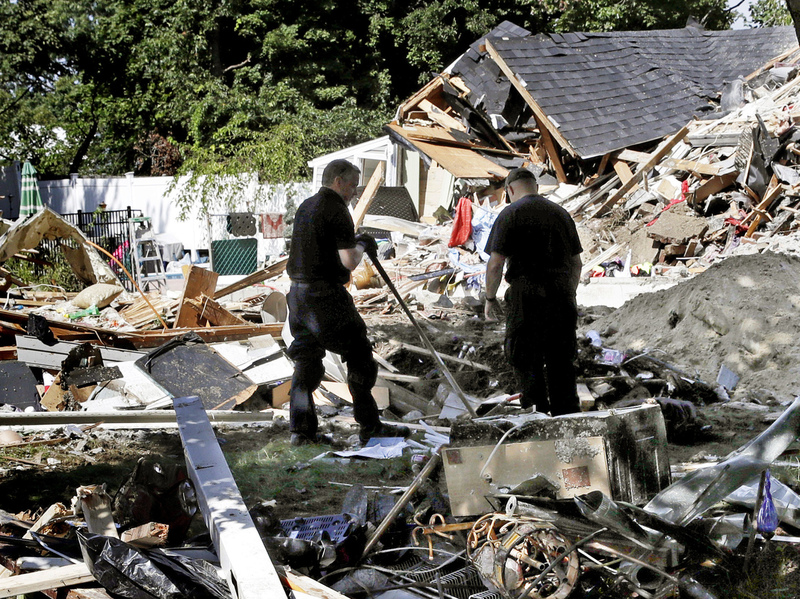 Fire investigators search the debris at a home where an explosion occurred following a gas line failure in September in Lawrence, Mass. When the old main was disconnected and started losing pressure, the regulators kicked in and flooded the new main with high-pressure gas. "As a result, natural gas was delivered to customers at pressure well above the maximum-allowable operating pressure which led to the ignition of fires and explosions in homes," the report states. A monitoring center for Columbia Gas in Ohio apparently received warnings about high pressure shortly before the explosions started but was not able to remotely control the valves that were causing the pressure to ratchet up. The federal investigators say the work plans for the construction job were put together by a field engineer with "limited knowledge about the importance of the regulator-sensing lines or the consequences of losing the capability to sense the main pressure." That engineer told the investigators that when he drew up the plans, he did not consult drawings showing where those pressure sensors were located. And while two departments in the company reviewed the plans, the Meters and Regulation department did not look at them, "because the field engineer did not believe at the time that the proposed scope of work was applicable to or affected" that department. Federal investigators concluded the explosions could have been avoided if all departments had looked over the plans and a registered professional engineer had approved them. Massachusetts does not currently require a registered professional engineer to sign off on public utility engineering plans. The NTSB is recommending such a change. "Well, I think it's about time," said professional engineer Frank Hagan in an interview with Mark Herz from NPR member station WGBH. Hagan works for a law firm that filed a lawsuit against the company. "It's my opinion that this incident could have been avoided had a professional engineer signed off on the work instructions." NiSource Inc., the parent company of Columbia Gas, said it is "thoroughly reviewing the safety recommendations" and "[looks] forward to discussing them in further detail with NTSB." It said it has taken safety measures since the incident, including surveying all of its regulator stations.